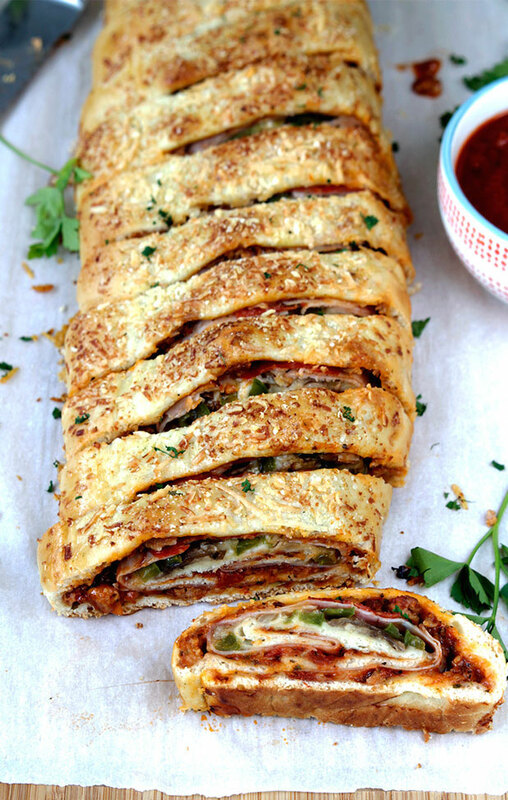 This is a fantastic recipe, stromboli is a bit like a rolled-up pizza. Making stromboli is very easy and a great way to get your kids in the kitchen and cook together as a family and help make a fun and delicious meal. They will truly enjoy it and the best part is you can fill it with whatever ingredients you fancy. For the pizza dough add all the ingredients into a large bowl and combine. Turn the dough out onto a floured work surface and knead for around 5 minutes until smooth ball. Place the dough into a large oiled bowl and drizzle extra virgin olive oil over the dough and rub in. Cover with plastic cling film and leave to rise for around 2 hours or until double in size. Roll out the dough on a lightly floured surface into a rectangle measuring about 44cm x 32cm/17in x 13in. Roll the dough up into a log to enclose the filling, gently sealing the ends of the roll as you go. When you get to the end that has no filling on it, gently press to seal, then place the roll seam-side down on a nonstick sheet tray. Brush extra virgin olive oil over the dough, season with a little more salt and pepper. Bake in the center of the oven at 180C until golden brown and puffy, 25 to 30 minutes. Allow the stromboli to cool 5 minutes before slicing it into thick slices.